The spirits are distilled on a handmade 300 litre copper-pot still, the first to launch in London for 190 years. The master distller, Jared Brown, crafts each product by hand, in genuinely small batches - never more than 500 bottles a time, often considerably less. This delivers stunning spirits that are smooth, full of charater and have true intensity of flavour. 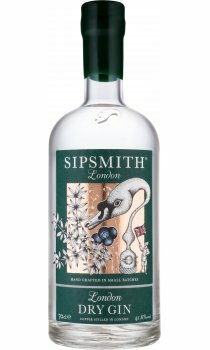 Sipsmith's London Dry Gin is distilled from the finest English Barley spirit with 10 carefully selected botanicals, and blended with the exceptionally pure water of Lydwell spring, one of the sources of the River Thames. The result is an interpretation of the classic London Dry style that nods to its heritage and emerges as a particularly dry gin with a wonderful burst of juniper and a zesty, citrus freshness. The worlds best gin! Smooth and full of flavour, the ultimate way to make a dry martini.